On Feb. 6, Bishop Robert D. Gruss of Rapid City, S.D., ordered a letter "[t]o be read from the pulpit at all Masses in the Diocese of Rapid City during the weekend of Feb. 9-10, 2019." An image of the letter can be seen below. 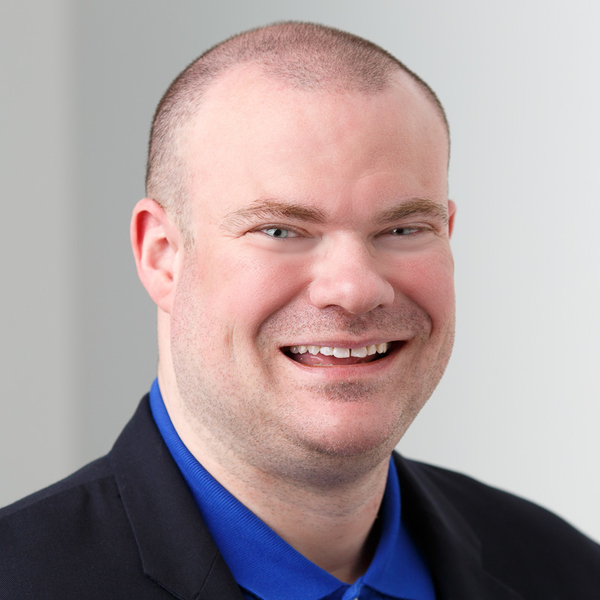 In it, Gruss asserts that the mission of Illinois-based Roman Catholic Faithful, which has been working to oust Cardinal Blase Cupich of Chicago, is "evil and guided by the Evil One." The bishop goes on to praise Cupich as "an effective leader and shepherd, leaving a legacy that will long mark the ministry in our diocese." 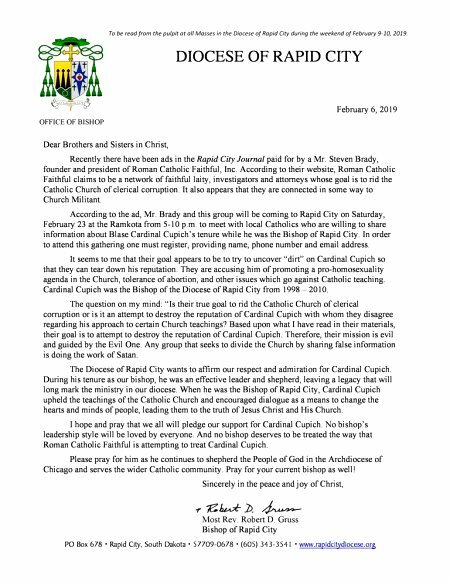 I am General Counsel for Roman Catholic Faithful, Inc, and I write this letter in response to your February 6, 2019 letter to your flock, a copy of which has been provided to me. I am impressed that Your Excellency is able to read the minds of our members as to our motives for coming to Rapid City. You mention Cardinal Cupich. Very well, I challenge you to a public debate on the following – "Resolved, that Cardinal Cupich has promoted perversion and error, and he has betrayed the faithful during the times that he has served as bishop prior to being named Cardinal and assigned to Chicago." The debate will be videoed and made available in its entirety on the Internet. I am willing to debate you personally, not one of the personnel on your staff. You state that no bishop "deserves to be treated" as RCF has treated Cupich. On the contrary, no faithful Catholic of any diocese deserves to be misled and betrayed as Cupich has done. This will certainly be a lively debate, assuming you are not afraid of actually participating. The debate would be no longer that 60 or 90 minutes, and I'm sure that one of your many persons leading "ministries" could take care of your responsibilities during that time. Thousands of boys have been molested during the last several decades. RCF is committed to stopping this horrendous abuse. One of things that will help accomplish this goal is transparency, contrary to the climate of concealment practiced by the hierarchy over the last 50 years. Therefore, a public debate would be very healthy. Please contact me at my Idaho law office to arrange a time for the debate.